This post follows on from those about Craft (18-Aug-2012 and 20-Aug-2012), textiles in Art as distinct from Textile Art (27-Aug-2012) and a side-excursion on Art / Textile Art / Documentary (22-Oct-2012). 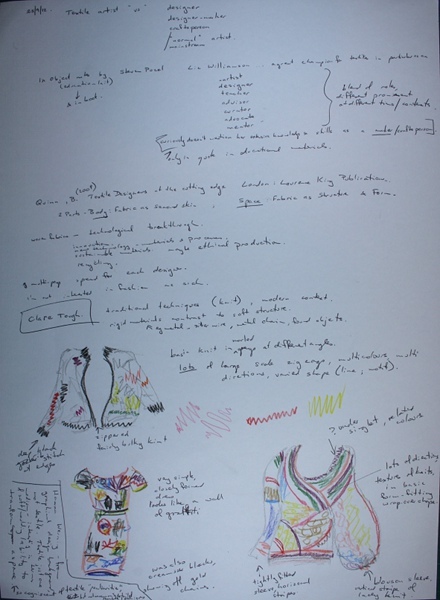 I don’t have any particular photographs of textile designs or designers, so the images in this post are of sketchbook work I did while reading two of the texts in the course reading list – Textile designers at the cutting edge (1) and Textiles Now (2) (also in my sketchbook starting 29-Sept-2012). After searching for quite a time, I haven’t found a single, concise, comprehensive definition of “design”. To design is to create a plan or specification for an outcome or product. There’s generally a functional aspect and there may be aesthetic considerations. Often a design will be produced in multiples or mass production, in different colour-ways and design variations. The production work could be by hand, machine, or a combination. Sometimes good design will go unnoticed, the item performing its function as expected. We’ve all experienced negatives from poor design. For example I once had an electric kettle, a simple and plain shape except for some decorative grooves along the length of the handle – which channeled the steam into your hand while pouring the boiling water. A designer may work in multiple disciplines. Their skills and interests lead them to collaborate and develop relationships with makers and industry to produce their designs. Alison Page is an Australian indigenous designer who has won a place in the British Council’s Accelerate program. Experienced in design for interiors and jewellery, Page is interested in working with manufacturers of textiles, carpets, lighting, or many other kinds of product. Her vision is about qualities of the design – beautiful, sustainable, and a spiritual layer telling a story about her indigenous culture. (3) Lucy Simpson is another Australian indigenous designer, telling the stories of her Yuwaalaraay family and homeland through textiles. Previously a graphic designer she now designs printed textiles for her campany Gaawaa Miyay working with Publisher Textiles to produce her designs. 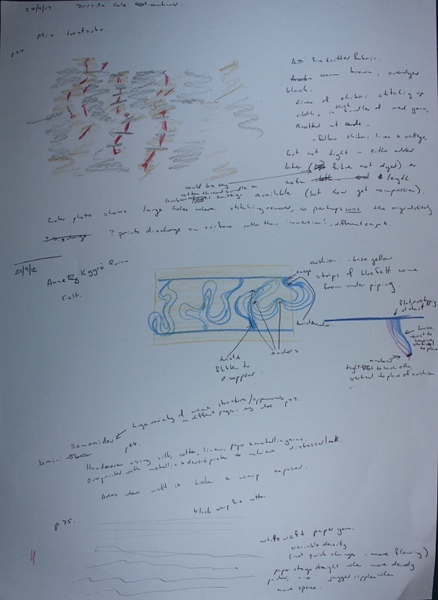 The tactile nature of textiles, the connection to memory that touch can give, is important to Simpson, as are beauty and sustainability (4). There are some interesting videos of Simpson talking about her work in the article cited (here) and on the Gaawaa Miyay site (here). Designers may or may not have specific knowledge of and skills in the particular media and techniques used to carry out their designs. A designer/maker will implement the designs they have created. They can develop a deep understanding of their materials and processes, leading to designs that take advantage of all their best properties. That doesn’t negate the possibility for pushing further, introducing new ideas and challenging accepted norms. In Weaving textiles that shape themselves Ann Richards devotes the final chapter to “Designing as a conversation” (6). In this design is presented as a reflexive practice in which the designer responds and adapts to the material, ready to learn from setbacks, to seek fresh ideas and challenges and to see the design emerge and improve through the process. 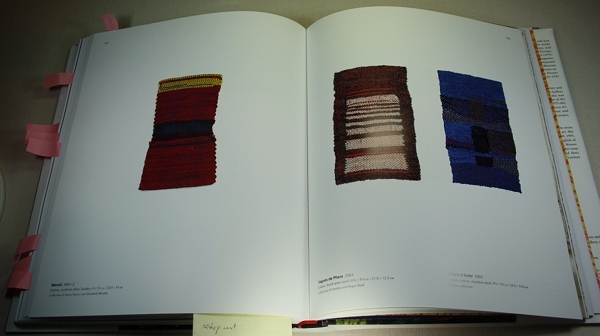 Richards presents a general process for beginning and developing a design, but her specific focus is the considerations and specifics of weaving. The depth of knowledge, the thought, care and respect shown for materials, product and process is inspiring. The many beautiful photographs of examples help too! I’ve already presented my end position – that today individuals regularly cross boundaries and combine and interleave different roles as designers, artists, craftspeople and more, working alone, with assistants, or in collaboration (blog post 22-Oct-2012). This week I got a new book in the post (well, a few new books, but one that is relevant just now). In her Foreword to One work: Sheila Hicks at The Mint Kathleen Jameson writes “…this one work is an outstanding example of the cross-pollination in the fields of art, craft, and design that is so pervasive in 21st-century artistic practice. In choosing thread and textiles as her medium, since the late 1950s Hicks has worked both as an artist and a designer, moving nimbly between the two worlds, decades before they overlapped more eloquently.” (5) I believe that boundaries in work descriptions and practices are much more fluid than in the past. Artists/designers/craftspeople in particular need to be flexible, creating and taking opportunities to make work, to find audiences and to make a living. We are, I hope, near the end of a period of adjustment when institutions and individuals in the field were coming to grips with this change and the implications. I’m not suggesting the old categories are meaningless or useless. They remain one component helping us work in and make sense of a complex environment – descriptive, but not proscriptive. I wrote the above a few days ago but it didn’t seem finished. On re-reading I can see some flaws in my argument. First, it might seem that I’m expecting everyone to balance multiple hats and to move between modes and types of work freely. Not at all. The answers and choices that are right for me will be different to another’s choices. I’m arguing against artificial boundaries, or the arbitrary rules of some Authority. Second, how does my concern for the preservation of craft fit in this? Certainly I feel concern about possible loss of knowledge and skills, and I am uncomfortable with the idea of designers-for-hire, who will turn their hand to any type of product in any type of materials. There’s more in my post of 16-Sept-2011 on Preserving Crafts. More thinking required. Finally, perhaps I am over-enthusiastic and just wrong. There may be some who have been able to cross boundaries, but that doesn’t mean that boundaries aren’t still current and enforced elsewhere or for other people. I have no answer to that. There will be lots of different experiences, and change doesn’t happen all at once. Time may tell. (3) Frew, W. (2012). The rise of the allegorist in Australian design. The Sydney Morning Herald, 19 October, p. 13. (5) Jameson, K., 2012. Foreword. In: One work: Sheila Hicks at The Mint. Charlotte: Mint Museum of Art, Inc, p. 9. This post has been sitting in draft form for over a month. It started as part of the Assignment 4 Research Point, which is investigation into the work of the textile artist. The idea was that having discussed Craft in earlier research points (blog posts 18-Aug-2012 and 20-Aug-2012), I could consider textiles in Art as distinct from Textile Art (blog post 27-Aug-2012) and then examine the work of designers and designer/makers (that was going to be this post). This would allow me to establish my overall concept that while depending on context all these descriptors can refer to different things, a particular individual will operate in multiple modes – craft, art, textile art, design, then add in teacher, author, sales person… I don’t think this follows a linear developmental progression – start in mode 1, then learn and progress to mode 2 etc. Individuals and their work are more complex, they do what could be categorized as mode 2, and then a bit of mode 1, and sometimes both at the same time, and very often after a time one can see that what appeared to be one thing should be reassessed. Categories and labels are useful to help us organise and extend our thinking, but we shouldn’t confuse them with reality or necessity. After all that I was going to take a deep breath, then write about two multivalent* individuals who include Textile Art in their practice. However before progressing with The Plan, I want to write about two exhibitions I visited this weekend just past. Eugène Atget: Old Paris is on at the Art Gallery NSW and includes over 200 original prints by Atget (1857-1927), who is considered the founder of documentary photography. I did have two images, believing them to be from a source which allowed this use, but have removed them due to copyright concerns raised since. The first image was The Bievre, Ruelle des Gobelins, May 1900. There is beautiful textural detail, shadows and reflection of light, an incredible sense of space and depth to the image. It appears to be empty of people, or perhaps there are a couple of wraith-like images in the distance, where people were moving during the long exposure. The second image was Rue de Seine and Rue de l’Echaude, c. 1900. The same comments apply. Being able to see Atget’s original prints up close was amazing. None are in fact black and white – the tones are sepia. Large areas of the photographs are very crisp and detailed. I don’t know photographic technique, but he used light-sensitive paper in contact with the glass negative, and never enlarged his images. Treating the photographs individually, doing conservation and inventory work – these processes can confer Art status. I find that thought confronting. The second exhibition was Dani Marti, Mariposa (Butterfly), at Breenspace. 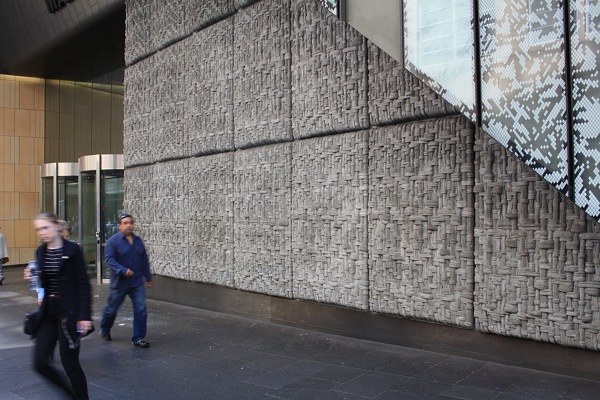 I’ve written briefly about Marti, or at least my attempt to see his work (blogged 25-Nov-2011), and his work on the facade of a shopping centre in Sydney (blogged 25-Mar-2011). The photos are of the facade, since I don’t have any of his gallery work. Mariposa (Butterfly) was a very different experience. It felt intimate and personal. The gallery is basically one large room on the third floor of a small office block in a maze of lanes in a once-seedy part of town. Marti’s work is a video – an interview of sorts – and accompanying woven wall pieces, portraits of ‘Mark’. The video was on a loop of around 16 minutes, projected on a full wall of the gallery. For most of the time I sat alone in a darkened room, my vision filled with ‘Mark’ almost naked, whirling white squares of cloth around his body in a trance-like dance. He was absorbed, ecstatic, lost in the sensuality and physicality of his dance. His eyes were closed or unfocused, except once or twice when he paused in his dance and looked directly at the camera, when he was suddenly present and conscious of himself and the viewer, and it seemed to me accepting of himself and his choices. He had made choices which allowed him to dance with joy and freedom and completely in the moment. At the same time I was aware of the cost of those choices (although perhaps I shouldn’t write “cost” – just more choices). According to the exhibition notes (3) Mark is a meth addict and drifter. The video was filmed in sessions six weeks apart, and in the later sequences Mark had one eye swollen shut, cuts and grazes across one side of his head – perhaps he had been bashed. He’d lost weight, and I was more conscious of the physical effort of his dance. The video was filmed in New York and the dance genre is “flagging” which originated in gay clubs. Almost everything about Mark and his choices is foreign and unfamiliar to me. But I sat there in the dark and watched his dance and thought about choices – Mark’s, Marti’s in what he chose to see and present (apparently he had much more confronting and gritty material), my own choices – and I thought about living in joy with the positives, at least for some moments, and accepting the negatives. And about accepting ourselves with our choices and their consequences. Filled with those thoughts, in fact with a new perspective on something that’s been causing some pain in my own life, it was strange to stand up and walk to the woven pieces on the walls behind me. Trap 1-3 consists of three pieces, each a deep, square frame of powder coated aluminium, the front and back enclosed with wide-set strips of leather in plain weave. Armour I is an even larger frame, woven through with nylon, polyester, polypropylene and leather, some a few centimetres in diameter, coiled around and creating a dense, defensive, spikey shield. It made me think of scar tissue or a hedge of thorns. Not at all my reading of the video – but then people are much more complex and changing than can be expressed in any static portrayal (and in this I regard the video as static, being frozen in time). There are some images and other perspectives of the work at these links: http://danimarti.com/exhibitions/mariposa-butterfly/, http://www.smh.com.au/entertainment/art-and-design/making-art-from-the-damage-done-20121005-273bo.html. Clearly this is art. It is also at some level documentary, so a strange contrast to Atget’s work – although both are carefully setup and arranged. Both also skirt or cross the line to exploitation of their subjects – Atget photographed prostitutes and ‘zoniers’ – people living in abject poverty in shanty towns outside Paris city walls; Marti’s subjects are often the vulnerable and marginalized (some of his work I would find very difficult to watch). For this Research Point the thing that really grabbed my attention was not Marti’s work as such, but the language used in a recently published monograph. “Dani Marti’s paintings are physical distillations of human encounters” Colin Perry begins in his essay Bound and unbound desire: Dani Marti’s paintings (4). Perry contends that these woven or stitched works “clearly relate to painting as a medium and lie within its historical trajectory” (page 16). Historical influences are cited, abstraction, art as anti-art, modernism, minimalism, Pattern and Design. Perry introduces the term “materialist portraiture” to describe Marti’s woven works. 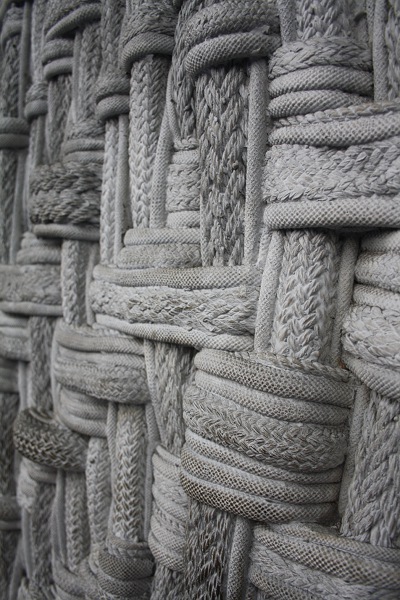 What I find significant is that Perry doesn’t deny or diminish the media and techniques used – rope, threads and weaving, among rubber, barbed wire and material assemblage. Marti’s cv includes studies in tapestry technique, and he does the majority of the weaving. In my reading so far about textiles and art I haven’t seen such a bald and bold statement, asserting the place of a textile work in Art’s development. As a weaver I’ve sometimes felt at a disadvantage in the world of textile art, working in grids and stripes, all the structural constraints. Was tapestry the only option? Yes, I’ve looked at the work of Anni Albers, Sheila Hicks and more, but I’ve never before felt such an impact from work – not just emotional, but seeing and maybe just a very little knowing more of a person and world so remote from me, and finding it so relevant to my own life. I don’t know how I can do it – create work of impact and intensity – but I’m hoping I can find my way. On which lofty note I will end. My exploration of the work of the Designer and Designer/Maker will progress another day. (4) Perry, C., (2012). Bound and unbound desire: Dani Marti’s paintings. In: M. Price, ed. Dani Marti. Ostfildern: Hatje Cantz Verlag, pp. 14-27. I recently wrote (posted 13-Oct-2012) about some classics of weaving literature. Yesterday I finished reading a more recent book – in fact published just a week or two ago. My tutor recommended it, but in a nice piece of timing it was already in the mail (from a pre-release order). Warp & weft: Woven Textiles in Fashion, Art and Interiors by Jessica Hemmings presents a wide-ranging exploration of contemporary woven textile art and design. Almost all of the many (clear and good quality) photographs are labelled with details of warp, weft, type of loom, and often weave structure, but the book’s focus isn’t really the specific technicalities of weaving. Instead the book is organised in themes – Threads; Light; Motion; Sound; Emotion; Community – showing the incredible variety and innovation, the inter-disciplinary approaches of artists and designers who work in (or close to) weave today. 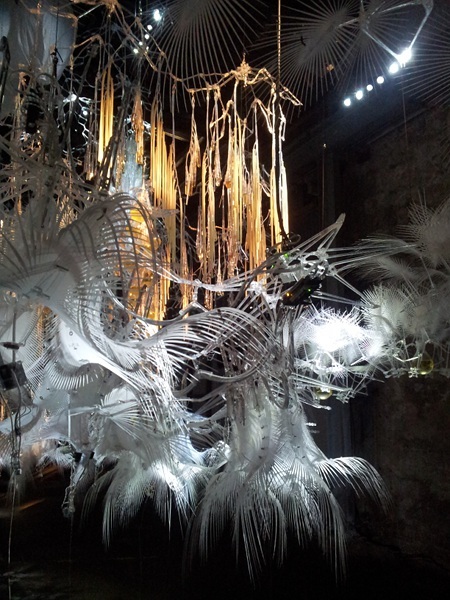 Hemmings also pushes boundaries, for example including Philip Beesley’s ‘Hylozoic’ series in her discussion of Motion. I took the photo on the left of Beesley’s work Hylzoic Series: Sibyl earlier this year during the Biennale of Sydney (see post of 8-Sept-2012). Seeing the original work was an wondrous, immersive experience – but I didn’t associate it with weave. However Beesley has identified woven structures as a basis for the series, partly developed out of dialogue with Warren Seelig. Other examples are clearer to me, the artists/designers combining weave with other technology such as microprocessors, sensors, fibre optics and LED displays. A dress by Barbara Layne and Studio subTela has an LED display, using Bluetooth to send a text or graphics message to change the image. See subtela.hexagram.ca for other work developed by this team. There’s a lot of potential there, but at the moment it looks to me quite raw and clunky, which of course is normal in developmental work. A number of the artists in the book refer to this point. Lise Frølund has a recurring goal of “the moment when complexity returns to simplicity” (page 76). The project illustrated in this book, a collaboration with musician Hanne Raffnsøe, used technology to interpret sound files in woven structure, and weave structure was converted back to music. While researching for this post I was interested to see that Frølund has also worked on connecting weave and light as well as sound – see www.lisefrolund.dk. The potential of new, high-tech materials is an area of exploration for many of the artists and designers. Returning to my earlier point, Elaine Ng Yan Ling uses new materials such as shape memory alloy yarns and veneer constructs in her weaving, but the technology isn’t the focus – it’s not there because it’s new, in fact it isn’t new any more. It’s one of the carefully considered elements of the design. Of interest to me in my course theme book work on Ageing, a number of the artists in the book use weave structures in a sequence of construction and deconstruction steps. For example Sue Lawty weaves with lead warp and weft, then uses a hammer to mark and fragment the material produced. A quote from Lawty: “The ambiguity of a corrupted structure is a real link with time, but there is a tension here between the stable longevity of lead and the vulnerable qualities of the woven fabric” (page 22). Elana Herzog staples woven cloth to walls, then tears away areas of cloth. A cloth is destroyed, but the remnants and grid of staples on the wall creates at least the appearance of a new cloth. Experimentation with rust dyeing and with abrading cloth are on my to-do list for my final project. There are clearly connections here, but I will have to think further. There are more links in the section on Emotion, such as Liz Williamson’s Protection series which raises ideas of bodily protection and possibly memory and identity. I’m partway through researching and writing a post on Liz for the course research point on textile artists, so more on her another day. There are many, many other artists and avenues of work included in Hemmings’ book and I think it gives a good overview of the contemporary, exciting world of weave. Only time will tell which avenues lead to major new vistas of weave and which turn out to be cul de sacs. It’s in the nature of such books to be incomplete, so I’ll finish with a couple of links to the Fluid Fabric work of Nathan Johns: nathanjohns.info/review.html and an interview on the World Of Threads Festival site (thanks to Jane for sending a link to this site which has some amazing artist, and which is an amazing time sink!). Johns weaves with polyethylene tubing and transparent fishing wire. Coloured water and air is pumped through the tubing – beautiful and mesmerising. This research point focuses on craft-based textiles. The course notes suggest that while boundaries are blurring in terms of material, technique, function and concept between craft and industry and between craft and fine art, “craft practitioners” continue to share a common goal – to produce one-off or small production run quality items – and craft-produced textiles continue to hold a place in our society. This falls into an ongoing area of interest for me – what “craft” is and the implications – which actually makes responding to this research point difficult. I’m starting with a selection of uses of the word. * Craft as cutesy decoration. Alexandra Lange recently wrote that “craft” as a word has lost all meaning. She refers to the TV show “Craft Wars” (I haven’t seen it here), where it seems people use perfectly good materials to make or alter objects to be neither beautiful nor useful, but cute. Martha Stewart is another name I associate with the dressup and kitsch end of craft (for example almost any link at http://www.marthastewart.com/crafts). * Mancraft. This is where the alpha maker man, self-sufficient, resourceful and wise, designs and makes stuff. My source on this is Dr Sandra Alfoldy’s special design lecture at COFA, available for download at http://www.cofa.unsw.edu.au/events/cofa-talks/listen. Alfoldy suggests the mancraft phenomenon is a response to the economic collapse, links to sustainability, and gives the illusion of control in a chaotic world. One could roughly group these first two as gendered variants sharing some values – homebuilding, control, bonding. Sandra Alfoldy’s lecture also introduced me to the term “compensatory consumption” which has been defined: “Compensatory consumption is engaged in whenever an individual feels a need, lack or desire which they cannot satisfy with a primary fulfilment so they seek and use an alternative means of fulfilment in its place.” (Woodruffe-Burton and Elliott, http://www.acrwebsite.org/volumes/v32/acr_vol32_132.pdf). I can certainly recognise such behaviour at times in myself. From my current workplace, if I go out one door there’s a fabric and haberdashery store a few steps to the left, a stitching and knitting store a few steps to the right, and an art supplies store across the road. If I escape by the other door I’m safe unless I cross the road to the bookstore. It’s a dangerous area after a challenging work morning. * “the craft” of something – the traditional techniques, design vocabulary, materials, natural constraints of a particular “discipline” or area of work. For an example of this usage in textiles see http://thetextileblog.blogspot.com.au/2012/05/franz-metzner-and-structure-of-carpet.html. Another craft (traditional skills and knowledge) area familiar to me is bellringing (for example see language in http://www.bellringingfilm.com/). I’ve previously posted about the Gucci artisan corner (http://www.gucci.com/us/worldofgucci/articles/artisan-corner#1), celebrating fine traditional craftsmanship, and of course there are guilds such as the one I belong to, the Hand Weavers and Spinners Guild of NSW (http://nsweave.org.au/) (see my post https://fibresofbeing.wordpress.com/2011/09/16/preserving-crafts/ on 15 September 2011). * A definition close to my own approach, by Max Fraser: “Contemporary craft need not be defined by genre, it can include a wide range of media, but whatever the medium, craft practice is at the core of the making process. It is a combination of hand, mind and eye – the technical mastery of tools, materials, aesthetic sensibility and design skills.” I particularly like this list of attributes of “…the more human centred definition of craft – where time, patience, evidence of hand skill, rarity, chance, snap decisions and risk of failure are all contributing factors to an object’s charm and value.” Interestingly Frasers’ essay “Lab Craft: 3 Digital Adventures in Contemporary Craft” (http://www.labcraft.org.uk/_downloads/Lab-Craft-galleryguide.pdf) is in the exhibition catalogue of a Crafts Council touring exhibition which displays the use of digital technology in craft. (Thanks to Cally for this reference). * “Craft” has been used very broadly. For example in “Making is Connecting: the social meaning of creativity, from DIV and knitting to YouTUbe and Web 2.0”, David Gauntlett explores the meaning of making and various philosophies of craft, from the skilled practice of a master woodcarver to traditional hobby crafting and on to trendy guerrilla crafts (knit-wrapped trees…). Gauntlett identifies an intrinsic human urge to make, and a joy experienced in making, whether that is handcrafts or well crafted computer code. He finds a connection between craft, creativity, our connection to each other and our entire culture, and ends the book with a vision for a political and social future where communities aren’t satisfied with consuming what is provided by “the system”, but take an active part in making the world their own. * “Craft” can also be defined very narrowly. I’ve been reading “A theory of craft: function and aesthetic expression” by Howard Risatti for some time, but I’m struggling and haven’t got far. Risatti takes the definition of craft very seriously, as a necessary basis for developing a coherent critical theory. Rather than using materials, techniques or form to identify craft, Risatti focuses on purpose and function – so craft objects have functions of containing, covering and supporting. In this definition jewellery is an adornment, and cannot be a craft object. Surface decoration is not an intrinsic part of craft. Tools are not self-contained, having a further purpose and requiring energy input to make them work, so are not craft objects. By this logic, Risatti finds that cutlery cannot be classed as craft. I got as far as chapter 4, where Risatti argues that craft objects are made by tools, as extensions of the hands and reflecting their motions, but not by machines (page 51). Just a couple of pages earlier he had clarified that levers are machines, giving mechanical advantage and changing direction, distance and speed of energy. That’s where I’ve stopped. I think the vast majority of looms have levers of some kind raising shafts (backstrap, warp-weighted and a few other specific loom types being exceptions). Woven textiles are definitely on Risatti’s list of craft objects (having the function of covering the body). I don’t know how he manages to reconcile this. I’m continuing with other reading, but that’s enough to chew on for one post! Most of the above is actually off-topic for the question posed in the course notes – why craft-produced textiles maintain a place in our society. I’ll get to that in my next post. * Reading – Elissa Auther: String Felt Thread (26-May-2012). 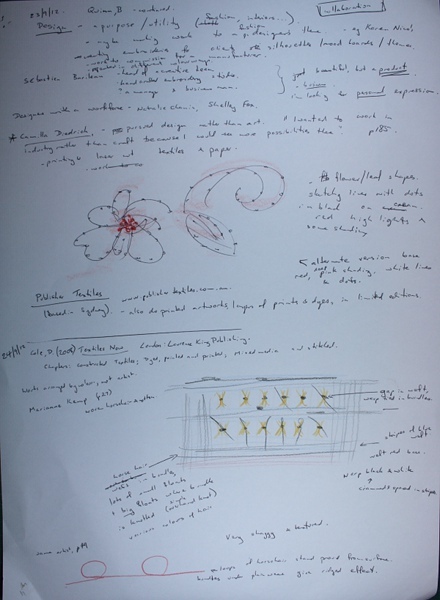 * Reading – Glenn Adamson: thinking through craft (6-July-2012). This book looks at craft in all sorts of ways, showing how it isn’t and can’t be art. It takes an analytical, academic, theoretical approach to “craft” the idea and contrasts it to modern avant garde art. It is, I am sure, deliberately provocative. The author has clearly done a lot of research and thinking, and he aims to get others thinking. Adamson proceeds in a systematic way to examine five perspectives or ways of thinking about craft – Supplemental (not autonomous); Material (versus optical); Skilled (more complex, but perhaps beside the point in art); Pastoral (that is nostalgic and limiting creative freedom); Amateur. He begins with a survey of theory, then history, then a critical analysis of specific works or texts. In one sense I enjoyed the book very much and felt I was learning a lot. Adamson covers a lot of territory, much of it new or only faintly familiar to me, and he generally explains his terms and concepts clearly and carefully. He certainly gave me a lot to think about, and I expect I’ll be re-reading the book in parts and as a whole many time in the future. I’d definitely recommend it to others. On the other hand the book made me cranky. Very cranky. Two main reasons – first, I don’t like his conclusions, which wouldn’t be a problem (after all it’s interesting when people hold and discuss different views) except that second, I think he indulges in some sleights of hand and leaps of logic which make his conclusions suspect. In most of the book Adamson is specifically referring to avant garde art. It has a theory and expressed concept behind it. It is autonomous (self-standing), generally optical, has an underlying principle of freedom, can transcend any limits, not necessarily created with great manual skill, in theory with intrinsic (not just market) value. On the other hand Adamson deliberately doesn’t define craft closely. It is a process and way of doing things, it has core principles, it limits itself. In my mind the tricky part is that this allows Adamson to select among all that is “craft” some examples that don’t meet the particular art criteria being considered. For instance in chapter 1 “Supplemental” he writes that art, a painting, stands apart and exists in itself. He then takes the extreme example of the frame around the art as representing craft, and shows that the frame supplements the art but isn’t art in itself. Not a hard sell – I suggest only in particular cases is a frame presented or claimed as art. Adamson does go on to give some more convincing examples, but one thing he doesn’t convince me of is that avant garde art is autonomous. It requires an “accepted critical account” (page 32). Some other recent reading suggests I’m not original in pointing this out. For example, in an article on the new hang at the Art Gallery of NSW John McDonald wrote that when considering contemporary art “one can be a fashion victim rather than an art historian and no one will notice the difference” (1). Or much earlier Tom Wolfe: “”Without a theory to go with it, I can’t see a painting … Modern Art has become completely literary: the paintings and other works exist only to illustrate the text.” (2) So much for autonomous. In chapter 4 “Pastoral” Adamson writes about the “sentimental escapism” of attendees at summer crafts schools. I certainly don’t accept that as an accurate description of the work we did in Liz Williamson’s class last January (post here), not that I’m claiming avant garde status but there was certainly no “air of crabby conservatism” (p. 168). This is one of many places where it’s convenient for Adamson’s position that he limited himself to avant garde art, because otherwise he would have to figure out how to accommodate in his theory all the art classes held at Sturt at the same time. The attendees there are covered in that “there is no such thing as an amateur contemporary artist, only an unsuccessful one” (p. 143). I wonder if artists who choose or need to earn at least part of their income by teaching thereby lose any status as Artists. One final sleight of hand. Adamson suggests that in its inferiority craft performs a useful function, acting as a “horizon” to art – “a conceptual limit active throughout modern artistic practice” (p. 2). Craft seems to act as some kind of foil to art, helping to intensify its art-ness. “The limits embodied by craft are not only psychologically comforting, but also conceptually useful” (p. 5). For me though as Adamson explores this frontier he seems to accept as art some work that has pushed into territory previously seen as craft. Adamson sidesteps the difficulty that an area or process or material that was part of craft is now to be seen as art – he has already dismissed as banal any circular argument that something is art because it says it is, but in this situation he doesn’t offer any other explanation for the discontinuity. So why did I keep reading, when the book made me cranky and had me muttering and scribbling copious notes (possibly a concern to other bus travellers)? Simply because it did give me so much to think about, and helped me further in my understanding of what I want to do and how I want to develop. A very worthwhile read. 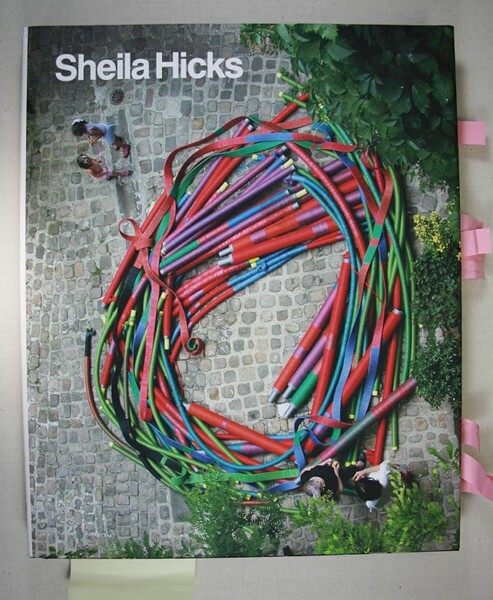 I’d been doing some research on an artist – Sheila Hicks. At the Sturt Summer school tutor Liz Williamson had a beautiful pile of inspirational books (or an inspirational pile of beautiful books) including Sheila Hicks: Weaving as Metaphor which was an exhibition of Hick’s small works and also the most beautiful book in the world. Amazon has some links for the book – $1,200 new, maybe $400 used (I found other sites listing cheaper, but they seem to be outdated or non-functional). I couldn’t bear to buy at such a price, but I did find Sheila Hicks: 50 Years, a book published in connection with the exhibition at Addison Gallery of American Art. It may not be the most beautiful book in the world, but it is a very nice book indeed and includes lots of great photos as well as three essays. So I flipped ahead looking at the photos, started reading the essays and was thoroughly enjoying myself when I came across this post on textileartscenterblog.com. It has photos of Hicks with some of her work at the Textile Arts Center – and it’s huge! Go back and look at the photo of the book’s cover. That work is lying on a road, with people standing around it. I guess because of seeing the other book first I totally misinterpreted what I was seeing – definitely not hold-in-your-hand scale. Perhaps not an exciting anecdote for you, but a jolt and a powerful reminder to me about the dangers of preconceptions and assumptions. Hicks was mentioned a number of times in Auther’s String Felt Thread (blog post here). Hicks was one of those working in fibre in America in the 1960s, somewhere on that border between art and craft. In her essay “Unbiased Weaves”, Joan Simon writes that throughout her career of fifty plus years Hicks has through her work questioned categorization of art, design and craft. Hicks has produced an incredible range of work – different purposes (architectural, conceptual, ephemeral, exploratory…), different scales, materials, ways of working (studio work, collaborative, for industry…). A significant facet that interests me is Hicks’s knowledge and honouring of traditional textile making while pushing to new and innovative methods and materials. I know I should aim to interpret what I read and use my own words, but this sentence from Simon on Hicks’s work in the 1977 Artiste/Artisane? exhibition resonates with me (it’s also on the edge of my understanding and I couldn’t possibly write it myself! ): “For though these were artisanal works, her conceptual reclamation of these objects into the realm of artwork signaled that the exhibition’s fundamental question was not the neat binary choice between artist or artisan – rather, that the history of twentieth-century art had widened the territory to incorporate one kind of thing into the field of another.” (page 110). 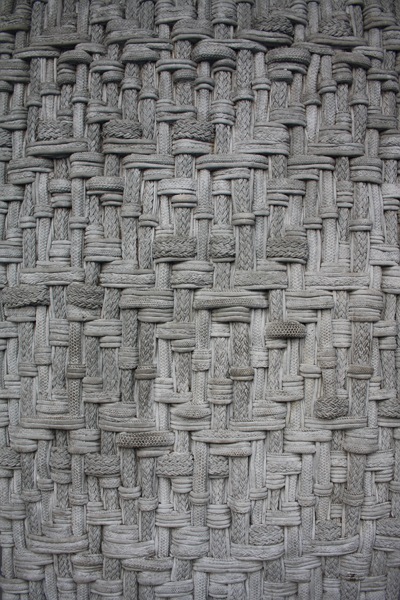 Combined with my interest in art <–> craft is a focus on weaving in particular, and though Hicks has used many techniques in her work weave has recurred throughout her career. In her essay “Ancient Lines and Modernist Cubes” Whitney Chadwick writes of the pliability and temporality that comes from the repetition in weaving. There’s a conceptual basis to Hick’s work that I frankly don’t understand, for example “new relationships between wall and plane” (p 169), the idea of a formal vocabulary, even “form”. Whatever the conceptual basis, Hicks has taken weaving in directions I have never seen before, and it’s both beautiful and fascinating. Getting a bit more solid, why do I like Hicks’s work and what have I learnt that could be useful for my own? (this based on Emma Drye’s advice, originally posted here and mentioned in my post here.) Using a thread (or bundle of threads) as a means of mark-making. The benefit of extended study of traditional textiles and weaving techniques – but not just the theory and drafts in a book, but looking at actual (in person or in photos), historic textiles and how they have been created. Looseness and freedom in the use of the basic grid of weaving. Bare warp and wrapped warp. Slits and volume and light. The impact and importance of scale! Practice – do the work. Try to avoid preconceptions and assumptions. Don’t define yourself or your work into a box. Be open. Point 1: I was way out of my depth for much of this book. I have no training in art history, and it would have been helpful to know about minimilist art, process art, post-minimilism, appropriation and installation art, and probably a whole lot more. Point 2: I enjoyed reading this book very much. I learnt lots of things about stuff I was already interested in, and I learnt about lots of new things that now interest me. While reading I had debates with the author in my head, agreeing and disagreeing on points and maybe a few pages later changing my view and/or deepening my understanding. My copy of the book is like a porcupine with all the post-it notes sticking out. With all of that, there’s no way I’ll be able to do justice to the book in writing about it. I’ll try to give my understanding of some of the points being made, then a few of my thoughts / questions / opinions (provisional, since I’m hoping they will evolve over time). The book starts with an exhibition in New York in 1969 – Wall Hangings, organised by Mildred Constantine and Jack Lenor Larsen. It was ground-breaking, challenging the perception of weaving and the use of fibre as necessarily “craft” and impossible in “fine art”. It received one review in the national art press – negative. The work was decorative, engaging, not demanding. It was not art. It was less than art. The book examines the distinction between art and craft, the history, the link to “women’s work”, the implications and changes in perception. It also examines the power and privilege involved in defining and policing “art”, and points out that art requires a not-art from which to distinguish itself. The hierarchy of art above craft seems to begin in Western Art in the Renaissance, with fine arts (painting, music, poetry) valued more highly than mechanical arts (useful crafts like bricklaying and weaving). The materials used seem to be important, plus the utility or purpose, and perhaps whether it is agreeable or labour to produce it. At some point “decoration” became a negative and concept, inspiration and idea became all important. Material – for art a vehicle, for craft “sacred”, a given. Composition – for art an imposed purposeful arrangement of imagery, for craft surface effect. Purpose – communicating something of significance versus production of a useful object. For the recipient – cognitive and related to sight (optic), compared to the significance of touch (haptic) in a craft work. Sheila Hicks, Barbara Shawcroft, Lenore Tawney and Claire Zeisler are among those used to illustrate “fibre artists”. They used fibre as a material, often in large scale off-loom works, and disregarding connotations such as utility and domesticity. Their work at times existed in a a kind of limbo between art and craft – aspiring to one, perceived as the other. I’m missing out a lot of information and nuances, but I think Auther posits that in challenging the definitions of Art to include constructs using fibre, the fibre art movement actually accepted the validity of the Art hierarchy – they wanted to be included in it, but were met with frequent rejection by curators and critics and seen as acting in the realm of textiles and craft, not sculpture, painting and Art. In contrast, there were established artists who began to use fibre in their work in the postminimilism movement. Robert Morris did extensive sculptural work made of industrial felt. His existing reputation as an artist and his published articles and essays concerning his work allowed the acceptance of that work as Art. The intellectual content shielded any negative connotations from textiles and fibre. A critical difference seems to be that Morris in his work might choose to address issues of femininity, whereas for many fibre artists their femininity was intrinsic. Eva Hesse was another artist who had sufficient credibility and connections to avoid the suggestion of craft in her work. Artists in the feminist movement challenged the negative associations of craft. They recognised the connection of the art – craft hierarchy to the social hierarchies of gender and race. They identified with the history of fibre art, and the anonymous or amateur women who produced it. However there could be a divide between regard for the possibly idealised past and the attitude towards current non-artist female textile crafters, who didn’t necessarily appreciate the need to be rescued from any low status. Auther personalises and focuses her review by examining the works of individual feminist artists – Faith Ringgold, Miriam Schapiro, Harmony Hammond and Judy Chicago. Regarding the latter’s work The Dinner Party Auther writes “… the work stands as an emblem of the feminist embrace of craft as the antithesis of elitist art and the problems associated with feminists’ appropriating the language and materials of women’s craft while insisting on their own status as noncraftspeople”. The distinction of art and craft was not the particular materials or techniques used, but whether they were used to express meaning, or the process was an end in itself. In her conclusion Auther brings the book to present day practices and concerns. Fibre is now accepted as as material used in Art. The social and cultural meaning of textiles can also be included in artistic examination, although possibly in an ironic approach (in contrast to the Martha Stewart style use of craft). Finally, I recommend you click here, to go to a post on the University of Minnesota Press blog which includes a short video of Auther talking about her work. I don’t agree that an object which is useful cannot be appreciated for its aesthetic qualities. I think there’s an awful lot of painting between the Renaissance and the twentieth century that would generally be regarded as Art but was basically decorative, not about concepts. Also those working in fibres and textiles can explore a wide variety of materials (eg today I spent with heat gun, soldering iron and plastics (I think? tyvek and lutrador)). I don’t accept fibre work is more personally limiting in material terms than say those who prefer to stick with canvas and oil paint. I value the technique and skill of traditional craftwork and feel strongly about the preservation of craft (see blog post here). Considering the thought, decision-making and calculations involved in producing high quality woven work I don’t see it as non-intellectual or rote work. The whole feminist slant on art <–> craft is tricky and only works with a narrow view on fibre crafts where women dominate in participant numbers. What about ceramics, or blacksmithing or … (the list goes on). Drawing a line on a continuum can be bad / random / subjective enough, but art <–> craft is not a nice neat two dimensional line, but a complex, multi-dimensional space. Boundaries are about exclusion and inclusion, about access and resources and acknowledgement and value and saleability. My preference is not to move them (the boundaries) but to … I don’t know, not rise above them but make them irrelevant. The same with hierarchies although I guess in honesty I do see a hierarchy because I prefer conscious, thinking, serious (in the sense of being serious about it, not that it can’t be funny or lighthearted), honest work. I’d like to make conscious, thinking, serious, personal, honest work. I’d like it to communicate, be meaningful, be beautiful – though not necessarily all those things all the time. I couldn’t honestly say if Art or Craft would be more important.